The progress of science, and indeed, of human knowledge, requires a dynamic tension between the mere accumulation of observations and “dusty facts” and a synthetic process in which the accumulated results of scientific observation and inquiry are woven together into frameworks that, in the ideal case, create revolutionary paradigms that enhance human understanding of apparently discrete and unrelated aspects of nature. The history of science and intellectual inquiry teach us that, as is so often the case with truly novel syntheses, established scientific and intellectual institutions are too ossified, and too invested in the conventionally accepted worldview, to allow the introduction of a new paradigm without putting up considerable resistance. One is reminded of the famous observation of philosopher Arthur Schopanhauer: All truth, he said, passes through three stages. First, it is ridiculed; second, it is violently opposed; third, it is accepted as being self-evident. We should be wary of rejecting out of hand the premises of a hypothesis that may one day seem self-evident. Evolutionary biologists have long been puzzled by what is perhaps the chief mystery of human origins: the explosive and rapid expansion of the human brain in size and complexity over a vanishingly small span of evolutionary time. There is also the mystery of hemispheric lateralization and the apparent de-integration of the right- and left-hemispheric functions that we humans suffer. In the book ‘Left In the Dark’, a culmination of over fifteen years of independent research into human evolution, the authors postulate that it was not always so; the universal myth of a pre-historic Golden Age, they maintain, is a racial memory that reflects our primate evolution in an arboreal, rainforest environment in which humans possessed mental and psychic abilities that have since become lost or atrophied in the profane ages that followed. That rainforest environment favored a frugivorous diet rich in flavonoids, MAO inhibitors, and neurotransmitter precursors, and relatively low in steroid containing or inducing elements. This dietary regime both mimicked and fostered a state, reinforced by positive feedback loops, in which pineal functions, including neocortical expansion and hemispheric integration, were potentiated; moreover, these neurochemical feedback loops were amplified in succeeding generations via the regulation of gene expression in the developing foetus, independent of conventional evolutionary mechanisms of mutation and natural selection. Climate changes or other environmental catastrophes forced several lineages of hominids as well as archaic/early humans out of their forest-dwelling ancestral home into much harsher savannah or grassland environments. As a consequence dietary regimens shifted toward roots, tubers, grass seed and a greater proportion of animal protein, triggering a reversal of the positive feedback loops that had sustained pineal potentiation and hemispheric integration in the paradisiacal, forest-dwelling Golden Age. Pineal dominance was disrupted by steroid-mediated, testosterone-driven functions primarily due to the reduced consumption of flavonoids and other steroid-inhibitory dietary factors. Changes in the dietary patterns that were forced on the population by this migration put an end to the rapid evolution of the human brain and triggered its devolution, ultimately resulting in the damaged human neural architecture that we suffer from today, and the myriad mental and physical deficits that are the legacy of our biological ‘fall from grace’. What is alluded to here is only the barest outline of an elegant hypothesis that plausibly elucidates many baffling aspects of human evolution, brain science, and physiology into a coherent explanatory framework. Ecologists have realized for several decades that the complex interrelations of plants and insects are largely mediated through plant chemistry, and that the interactive dynamics we can observe in these processes is a reflection of millions of years of plant-insect co-evolution. Evolutionary biologists have long suspected that similar co-evolutionary processes, mediated by interactions with plant secondary products, have influenced the evolution of vertebrates, including primates. The hypotheses presented in this book are incomplete, and are even now being refined and developed; however, even in their present form they present a credible foundation on which to build a better understanding of who we are, and how our puzzling human species got to be the way it is. © 2007 Dennis J. McKenna, Ph.D.
"I have a long-standing interest in natural products, and in the potential for plant-derived medicines leading to the discovery of new modalities in health and healing. The integrative, cross-disciplinary perspective that characterize the Center make it the ideal venue in which to pursue research and education in the area of botanical medicines and natural products." 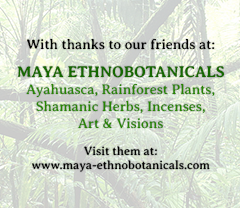 Dr. McKenna brings more than 25 years experience in biosciences, biochemistry and pharmacognosy to the Center for Spirituality and Healing, where he is a senior lecturer on topics that include ethnopharmacology and botanical medicines in health care. Dr. McKenna earned his Master's degree in botany at the University of Hawaii in 1979 and his doctorate of botanical sciences at the University of British Columbia in 1984. Since that time, his wide-ranging experience includes serving as the Director of Ethnopharmacology at Shaman Pharmaceuticals and as senior research pharmacognosist for Aveda Corporation in Minneapolis, Minn. He is the founder and executive director of the Institute for Natural Products Research and editor-in-chief of two publications: The Natural Dietary Supplements Pocket Reference (INPR, 2002) and Botanical Medicines: The Desk Reference for Major Herbal Supplements (Haworth Herbal Press, 2002). He serves on the Advisory Board of the American Botanical Council and the Editorial Board of Phytomedicine, the International Journal of Phytotherapy and Phytopharmacology. he is the author or co-author of more than 35 scientific papers in peer-reviewed journals. Dr. McKenna has special interest Ethnopharmacology, botanical medicines, natural products and drug discovery and medical applications of psychedelic agents. Nice piece of writing, but I question the premise of lowered levels of androgens/steroids in our ancestors. Our closest relatives, the other primates who are still living in tropical forests, ARE eating diets heavy in fruits and the succulent parts of plants…yet have testosterone levels equal to or greater than modern humans. Tremendously higher in the males, which results in the the more distinct sexual dimorphism among primates OTHER THAN HUMANS. It is doubful that our ancestors were lacking in testosterone or estrogens (among other steroids). Note the relationship between the term “estrogen” and estrus. Human females do not undergo estrus. They have a gentler, monthly menstual cycle…a result of lower amplitude “hormonal tides”. Note that estrus as well as distinct testosterone modulated sexual dimorphism is found in our closest ape relatives, the chimps, and in the gorillas who consume less animal protein in their diet (who have a diet closer to the aboriginal diet described in the article). Attractive premise, but I’m not aware of physiological evidence that supports it. I may need to to review my human paleontology, but I seem to remember that strong sexual dimorphism was evident in our early upright ancestors that wandered onto the savannas. This diminished in “later models”…indicating that a shift in hormones happened after the dietary changes to cooked meat (scavenging in the wake of grassland fires), grass seeds, and tubers…not before. Have you considered predation as a possible cause of the “fall”? I recently posted a blog on this topic at http://13muluc.blogspot.com/. if anyone is interested. The post is entitled “Is it I?”. Unconscious consumerism is responsible for our alienation from the sentient intelligence of nature. You are what you eat. “Chimpanzee males reacted to the competition as if it was a threat to their status, while bonobos reacted as if a potential competition is stressful by showing changes in their cortisol levels,” said Victoria Wobber, a Harvard graduate student and first author of the study. Human males usually experience an increase in cortisol before many types of competition in a similar way as seen in the bonobos. However, if men have what is called a “high power motive,” or a strong desire to achieve high status, they experience an increase in testosterone before a competition. “These results suggest that the steroid hormone shifts that are correlated with the competitive drive of men are shared through descent with other apes,” Wobber said. While some men may seem more bonobo-like before competition and others more chimpanzee-like, something unique about human males is that after competition they experience an increase in testosterone if they win or a decrease in testosterone if they lose — which accounts for giddy or depressed sports fans following a win or loss. This variation in hormones post-competition was not observed in either chimpanzees or bonobos. This work is nothing short of groundbreaking. It sounds extremely cliche but this stuff has the potential to literally change the course of human history. Initially the impact of it and ‘groking’ it can be difficult for our current state of mind, but after only a few years of research and experimentation this just keeps making more and more sense and is growing new facets often. As Tony has said , you really don’t begin to realize the extent of the damage first hand until you begin fixing the comprehension kit. Many will outright refute the idea but this in and of itself is a symptom of our insanity when you think about it. The evidence is incredibly strong, and more is surfacing all the time. Not only that, but as our perception grows, so can the depth of our comprehension of already existing information. Like ancient texts, for example. Why not at least double check, just to make sure? We must realize that the current paradigm, seen through the lens of the left hemisphere, is A-OK..shift it, and the whole thing changes dramatically. It is great to see people sharing information and such. Our society will never become what we need to be untill we are informed. Ignorance is truley bliss. To Caboclaudio, about the ScinceDaily.org mention; I’m on that site just about everyday. I have credits in Biotech and love reading about new advances in science. I just wish more people took twenty minutes out of their busy lives and excercised their brains for once. Thank You! I wonder what we will evolve into eating a diet based on processed junk food topped with the absence of natural selection. The fall INTO flesh… Where do most people go for aYAHUAsca? Peru. What is located mainly in Peru? ELONGATED SKULLS. All the genetic manipulations are recorded in the ancient manuscripts. It couldn’t be any plainer than ALL FLESH was corrupt. We genetically manipulated ourselves into a fallen state.